Hey everyone! It’s been a while since the last post. A lot has been going on and the Data-Shapes team has been very busy. Most importantly, Data Shapes is now a company! We are based in Paris and provide cutting edge support to AEC companies, involving BIM management, training and custom workflow/tool development. We are very excited about it and would love to know if you or your company may have any needs. 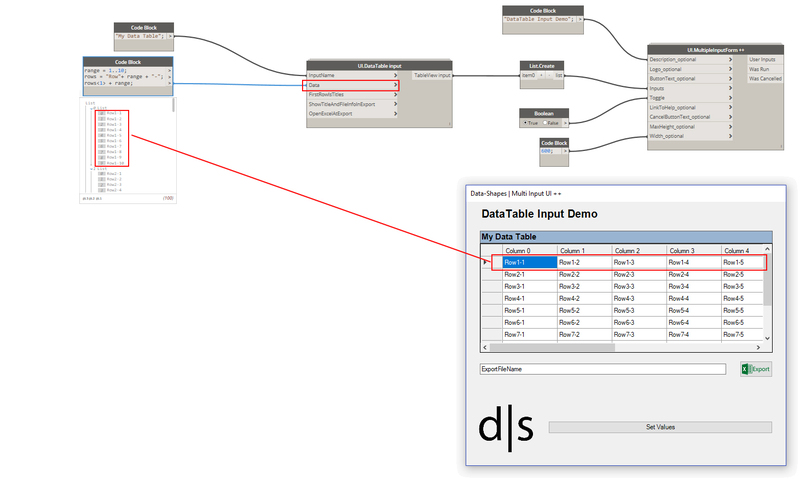 Today’s topic is the new addition to the Data-Shapes package (version 2018.8.7) : UI.DataTable. It’s been in the works for a little while and is finally ready to be shared. 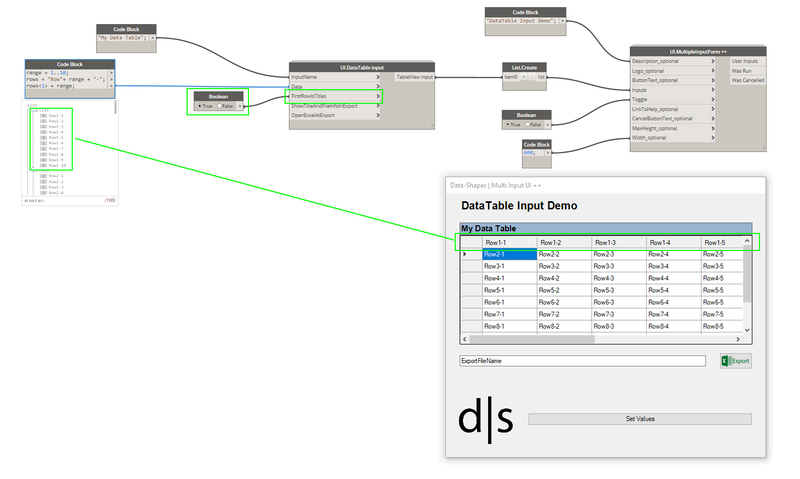 It basically allows to add an Excel like data table within a Data Shapes Form using UI.MultipleInputForm++ (which I assume you are familiar with by now :)). Important note: If you update the package, you’ll have to make a little manipulation on pre existing scrpits using Data-shapes nodes : You’ll have to right clic on the new optional inputs and check “Use default value”! Default values must be activated an all inputs added at the package update. Tip : If a node needs to have its default values activated, its header will appear in light gray. Once you activate the default values for the new optional inputs, the script will function normally. You won’t need to do this when using new instances of the nodes. The “ShowTitleAndFilesInfoInExport” input is optional. 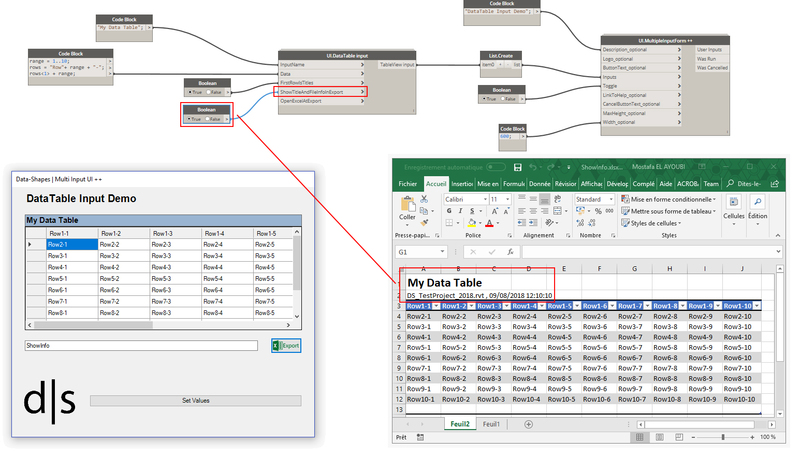 When set to true, you export your DataTable table along with the active Revit document name and date and time of export. The default value of the input is set to true. That’s pretty much it. As always, all feedback is highly appreciated. Also, if you have any use case or suggestion please let us know. Also, the github repo is up to date if you want to check the code! 1. Output List of Lists reflecting columns of data. 2. Include transpose option. 3. Include option to include Column 1 as row names. Maybe I’m not understanding this request, but as I’m using this node, this is already possible. I’m showing the user a table of data (some of which are current parameter values), and then allowing them to make edits. This brings me to my suggestion. Allow some manner of defining which columns are editable. I’m using this for some model checks, and the UI basically says to the user « hey… these parameters values don’t look right… do you want to change some of them? » It works great, but there is an opportunity for the user to edit some of the other columns that I don’t want them to edit. So maybe let us provide a list of booleans corresponding the number of columns or something? True’s are editable, and false’s are not editable? By the way, this package is amazing. Thanks for making the world a better and more efficient place.